Click here for 11 full quotes from Jeb Bush in the book Profiles in Character. This book was written in 1995, after Jeb Bush had narrowly lost the 1994 Florida gubernatorial election, and before he won the 1998 election. In other words, it outlines Jeb's policy stances with the focus on addressing issues he thought contributed to his 1994 loss and would contribute to his 1998 victory. The book is published by "The Foundation for Florida's Future," which is a think tank that Jeb founded after the 1994 loss. In other words, Jeb's Foundation was founded to publish this book, in conjunction with other projects focused on winning the next time around. Of course, those methods worked, and Jeb overwhelmingly won the 1998 election (and even more overwhelmingly won his 2002 re-election). The title of this book is a take-off on John F. Kennedy's pre-presidential book, Profiles in Courage. Jeb's framing mechanism, focusing on "character" instead of "courage," implies that Jeb considers character the most important attribute of leadership, where JFK considered courage the most important attribute. JFK's concept of "Profiles" as an organizing theme continues its relevance, as illustrated by Caroline Kennedy's 2003 book Profiles in Courage For Our Time. All of these "Profile" books focus on individual inspirational stories. Abortion: In 1995, Jeb went on record calling abortion a moral issue. As governor, Jeb focused on more practical matters such as banning stem cell research. Gay Rights: In 1995, Jeb called the gay rights movement a "modern victim movement." As governor, Jeb did not push the issue (as he has not pushed other divisive social issues). Corporations: In 1995, Jeb used the term "corporate welfare," a term usually used by anti-corporate populists. As governor, Jeb pushed two major programs that could be considered corporate welfare: using state tax money for "Touchdown Jacksonville" (a Florida NFL team) and using federal stimulus money for the Scripps biotech center. Both of those projects were widely praised, but Jeb certainly did change his view on corporate welfare. Crime: In 1995, Jeb cited the "trivialization of crime"; as governor, he focused heavily on "tough-on-crime" enforcement. Education: In 1995, Jeb focused on "grade inflation"; but as governor, he focused on charter schools and education vouchers. Welfare: In 1995, Jeb proposed making welfare "shameful"; as governor, he pushed for faith-based organizations to provide welfare services. Those differences are more about how the issues are framed: In 1995, Jeb used "character" as an organizing theme, and framed all of the issues as aspects of morals and values. As governor, Jeb had to actually govern, and hence had to translate those thematic issues into practical policy. This book demonstrates Jeb's consistency over the years, more than providing evidence of changing stances. We presume Jeb will write another policy book in preparation for the 2016 presidential race (if Jeb authors a book in 2013 or 2014, that is strong evidence that he is planning to run). Until then, this book is all we can go by. No need to teach about abortion if we have moral absolutes. Gay rights & feminism are "modern victim movements". Fight corporate welfare: snouts out of public trough. Heinous crimes no longer news: exposure lowers norms. Grade inflation breeds culture of falsely perceived success. Shame fathers who walk away from paternal obligations. Proper role: public order & general welfare. Focus on virtue & character, not values. Pass moral judgment & teach virtue to our children. Practice tech in context of virtue; not isolated pleasure. Taking welfare should be more shameful than working. 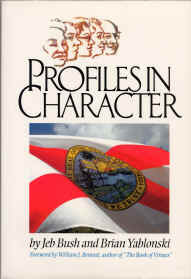 The above quotations are from Profiles in Character, by Jeb Bush & B.Yablonski.